As you may be aware, Nazgrab’s Yella Deff were the laughing stock of Mektown, having a total of zero victories to their name. 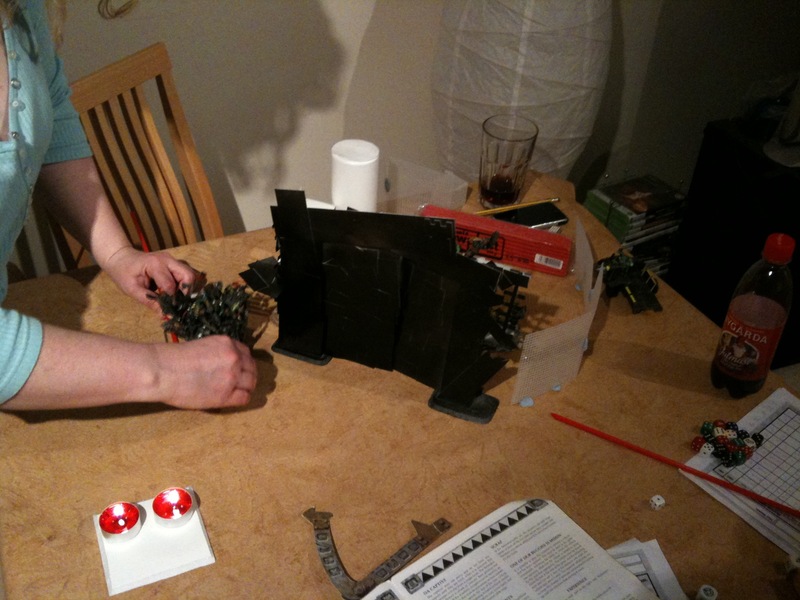 Despite a rescue attempt, one of their lads was still in the hands of a rapidly expanding Morker mob called Da N00bz. There was a mob rating difference of ~40, making the mob underdogs by quite a considerable margin, but no boyz left behind, not in Da Yella Deff! 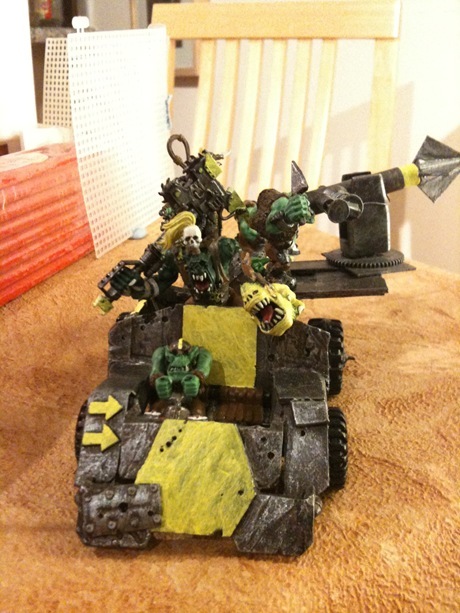 Still, in true over-compensating tradition, Nazgrab rallied his boys, including their new slaver, Grimfang, and his grot, Snik, to make another go of it. 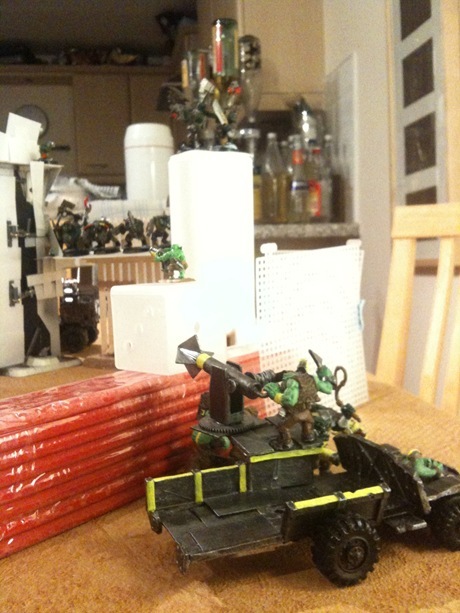 Despite the risk of taking in their wheels, their harpoon-packing war trukk, Grin, Nazgrab thought it best to get in fast, getting him to the fort in no time, well before any of Da Noobz could get back. Nazgrab was, unsurprisingly, bricking it, looking down the barrel of at least five weapons, let alone enough cutlery to cut him and his lads into very small pieces! Get up yez, yer blind zoggaz! Not too happy about being used as a distraction, Nazgrab turned around to see that Thogskin had managed to get Ardkopout of his shackles. 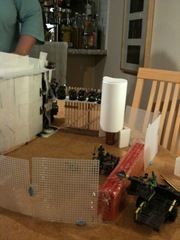 A mad dash for the wall ensued and all but Snik made it over. 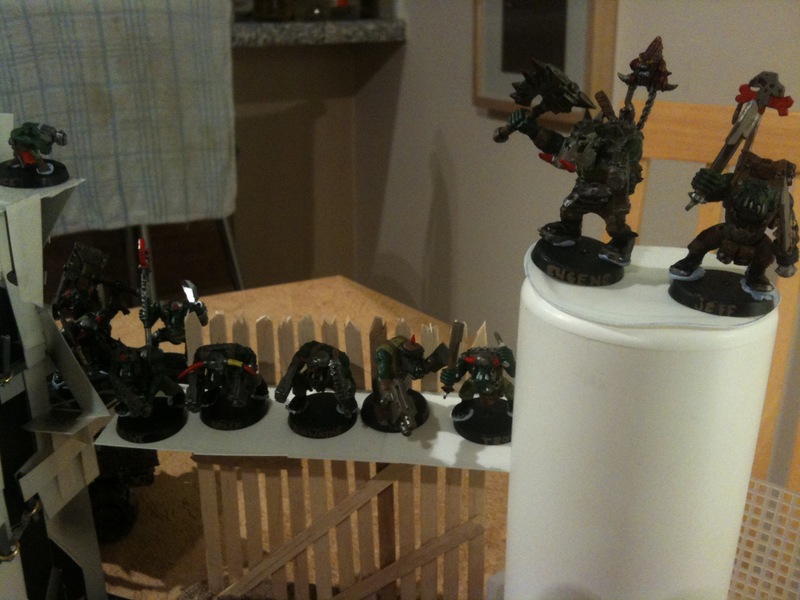 Pushed to the back of the group, the grot was suddenly feeling very lonely on top of the wall, surrounded by snarling orks. With similar freakish fortune, most of the shots missed their mark, although he did hit the deck when a shot clipped him in the leg, giving him a moment to consider how much nicer his shoota was than the puny slugga Horace was allowed to wield. Snik considered that whilst things were looking bad, at least his mob looked after their own. Managing to sling himself over the wall, Snik rejoined the mob, much to his relief, even if Grimfang wasn’t looking too pleased about the wait. Better the devil you know, eh? With an ascending whoosh of gas turbines firing up, the lads were away, yelling insults and cheering. Finally, a big one up for the good guys! This entry was posted on Monday, October 26th, 2009 at 22:33	and is filed under Battle Reports. You can follow any responses to this entry through the RSS 2.0 feed. You can leave a response, or trackback from your own site.